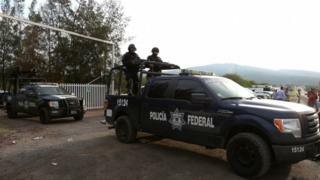 The Mexican government's human rights body has accused police of killing 22 people in extrajudicial executions in a raid on a drug cartel last year. One police officer and 42 suspects were killed in the raid on a ranch in Tanhuato, Michoacan state, on 15 May. Officers said they had returned fire in self-defence but the high death toll aroused suspicions. The National Human Rights Commission (CNDH) says police attempted a cover-up. Police dispute the findings. Human rights groups in the country have long been demanding an improvement in policing standards and an end to arbitrary killings. Previously, the government said there had been no human rights violations during the raid on the ranch. They said a war was being fought between two local drug gangs and those killed were believed to be members of one of the cartels. Police used a Black Hawk helicopter during the operation, reportedly firing some 4,000 rounds into the ranch, known as the Rancho del Sol, during the initial assault. The helicopter itself was hit by gunfire, investigators found. "The investigation confirmed facts that show grave human rights violations attributable to public servants of the federal police,'' commission President Luis Raul Gonzalez Perez said. Mexico's national security commissioner, Renato Sales, who oversees the federal police, rejected the CNDH allegations. "The use of weapons was necessary and proportional against the real and imminent and unlawful aggression," he told reporters. "That is to say, in our minds they acted in legitimate defence." Michoacan has become one of Mexico's most violent states because of the rivalry between cartels.